As a resident of Clifton, five minutes’ walk away from the River Ouse, I’m close to and fairly familiar with a major part of our flood defences: Clifton ings. Their role in flood management has become clear. So much work has gone in to managing these flows and floods. We’ve seen it all before, to some extent, but the river levels this week were apparently the highest since 2000. 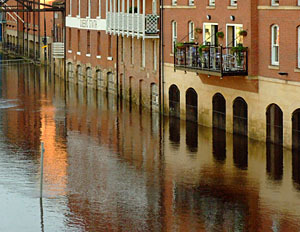 During a walk through the city centre areas hit by flooding, the two most dramatic and memorable moments were the points where the more obvious flood defences hold the river in. At Scarborough Bridge, where I found the floodgate closed, and the river racing by so high on the other side, and when I walked along the river opposite the Guildhall. In both those places, the river level on the watery side of the flood defence wall was higher than my feet on the dry side of it. Our instinct about how things work in nature makes this feel just wrong somehow. Having a river channeled like that, artificially high – by rights we should be fighting against drowning, taken along with it. But there it is, on the other side of the wall, rushing by. A bit seeping through the sealed floodgates here and there. It wasn’t always so carefully channeled through the centre of the city, and used to spread its flood waters further. You can see how it still wants to do that, the way it seeps through the floodgates. Less contrived than the walls and gates, more natural, and indeed more beautiful, are the flat areas of land we call the ings. But these are flood defences too, and those upriver take in much of the floodwater before it reaches the historic centre. These areas turn into lakes when a flooding crisis occurs, with their earthen banks holding the water in and preventing further spread. So though the city centre suffers damage from flooding, it would presumably suffer from far higher river levels if some of the water rushing downstream hadn’t been taken in by the ings at Clifton. 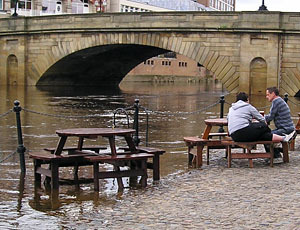 Old photos of floods in York show how things have changed, how the waters have been managed. Flood waters are shown covering North Street and Rougier Street, before the walls and gates were built to keep the water in and to channel it. Marygate too often flooded in its lower section, before the walls and gates were installed in the late 20th century. The stone arches of Ouse Bridge have been photographed in times of flood for more than a century, maybe since photography’s earliest days. They’re a useful reference point. We compare dramatic pictures of the water apparently just inches from the top of the arches, in the various major floods. A flood in 1892 seems to have been recorded on camera as particularly spectacular, and there have been many major floods over the centuries, before and since. I wonder whether we can rely on such comparisons, as presumably our modern-day channeling of the Ouse in times of flood lifts its levels higher as it approaches Ouse Bridge, as the North Street walls keep it in. In the old days, before artificial flood defences, the Ouse spread where it wanted to, across those riverside areas and streets mentioned earlier. It lost some of its volume and force by heading over the ings, up Marygate, into the Leeman Road area, across North Street and Tanner’s Moat, into the Museum Gardens all around the hospitium, etc. Now less of it escapes on the way to Ouse Bridge, but we still use their arches as a handy reference to gauge whether things are worse than previous floods. 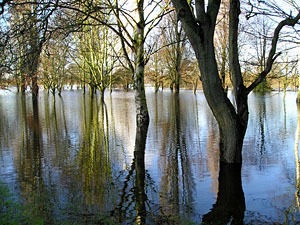 Fulford ings and Middlethorpe ings take in more floodwater as the Ouse leaves the city centre. They too presumably result in a lowering of the flood level downriver by taking in the expanding Ouse. 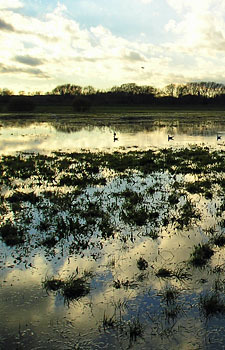 But as a Clifton resident I’d like to particularly thank our Clifton ings, for heroically absorbing millions of cubic metres of water, saving the historic core from further flooding. The generous lakes of Clifton, so I’ve read, have the effect of lowering the peak flood level in the city centre by 150mm. It’s not just the official designated areas taking in some of this flow of water before it hits the city centre. 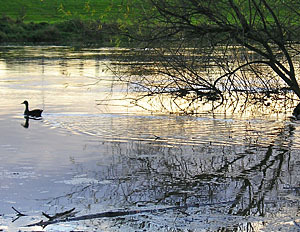 Water of course doesn’t discriminate – it finds its level, and in doing so also floods the playing fields of St Peter’s School, and parts of Homestead Park, as pictured here. « Why does York flood? Thanks for this really interesting article, and for linking through to my blog. The historic photo comparison brought up lots of comments on our facebook page about how the flood defences had changed, so it’s great to find out more about what actually does protect the city – especially the ings. I grew up in the Aire valley, which regularly naturally floods and didn’t realise that York has it’s own undeveloped areas managing water flow. I well remember flooding in York. my Granny and Granddad lived in the alms houses in Skeldergate. I also remember the Leeman Rd floods. so many depressing times for people down there. The watermark on the walls, the ruined furniture. the piece of carpet that might be left at your front door later. So much misery when you returned home if you were lucky enough to have somewhere to go. I hope that the river defences are now able to cope. Time to implement any plans that might aleviate this age old problem. I believe that when Leeman Rd was built that it was known the houses would flood if built.